What is the Ubisoft Tom Clancy's Ghost Recon Wildlands Game? Tom Clancy's Ghost Recon Wildlands is a tactical shooter video game developed by Ubisoft Paris and published by Ubisoft. Tom Clancy's Ghost Recon Wildlands is an open world game focusing on a conflict with the Santa Blanca drug cartel in Bolivia. It was released worldwide on March 7, 2017, for Microsoft Windows, PlayStation 4 and Xbox One. What can Ghost Recon Wildlands Credits be used for? 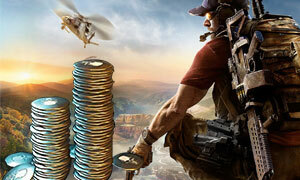 Wildlands Credits are virtual currency in Tom Clancy's Ghost Recon Wildlands that can be purchased with real world money via Joymmo.com online store. Tom Clancy's Ghost Recon Wildlands Credits are the Digital Codes, which can be used to purchase in-game content, such as Ghost Packs, weapons, attachments, costumes, boosters, vehicles, weapons, skins, and more. Just order GR Credits from us, you will get biggest discount!